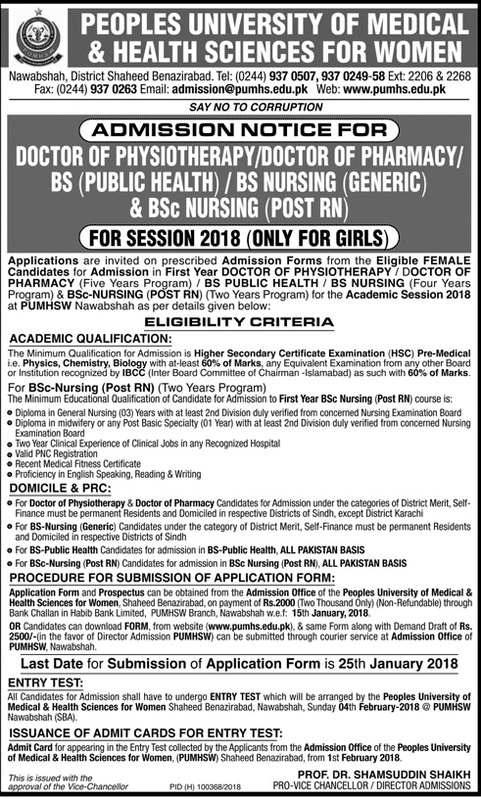 People university of medical and health sciences (PUMHS) Sindh has announced the opening of Admissions 2018 in undergraduate and postgraduate degree programs. PUMHS is one of the topmost universities providing quality education to women in the field of medical and health sciences. 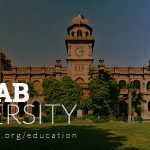 University offers the admission into M.B.B.S, DPT, Doctors of Pharmacy ( PHARM-D), BS in Nursing, BSPH, M.D in Cardiology, M.S in Neurosurgery, Orthopaedics & Paediatric Surgery. 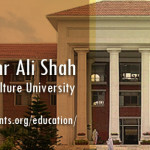 Ph.D. in Pharmacology, Public Health & Epidemiology. 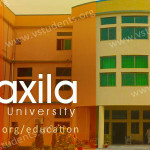 This medical university has its main campus at Nawabshah in the province of Sindh. 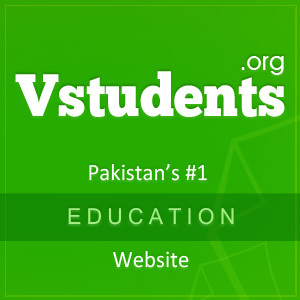 Admissions are offered on open merit and only female students are eligible for the admissions. 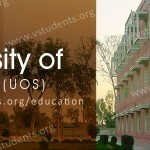 Peoples University of Medical & Health Sciences for Women, Nawabshah was established by the Government of Sindh in 2009. Pakistan Medical and Dental Council have approved the courses offered by the PUMHS. 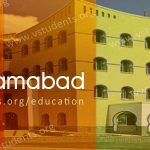 In this article, you can get information about admission last date, how to download admission form, PUMHS fee structure, eligibility criteria, schedule of medical entry test, display of merit lists. People university of medical and health sciences is pleased to announce the start of admission in undergraduate and postgraduate degree programs in the field of medical & health sciences.These medical colleges are offering admission in different Subjects like M.B.B.S, DPT, BSPH, Ph.D. in Pharmacology and more. PUMHS has published the admission advertisement describing the courses offered by the university, due date, admission form download, entrance test, merit list and admission schedule for the session 2018. PUMHS declares that planning for admission 2018 is in progress allowing the candidates to take admission in the field of medical field. PUMHS Spring admissions deadline for DPT, BS-Nursing, BS Public health is given below. PUMHS admission advertisement can be downloaded from this website. Eligibility criteria and requirements, admission schedule and last date to apply for admission in mentioned in the PUMHS admission advertisement. PUMHS Fee structure for the year 2018 is presented here for the students who wish to get information about different study programs and their fee packages. It should be noted that fee structure of PUMHS can be seen for a different degree program in the prospectus for the year 2018-19. 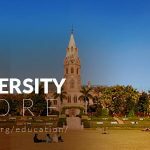 Admission form to apply for admission at the People University of Medical and Health Sciences for Women PUMHS applicant should download the admission form for the year 2018 by clicking Here. To apply for admission at PUMHS, please download the form and read the instruction for filling the form carefully and admission advertisement should be followed. 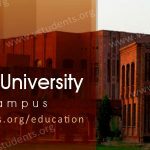 Admission criteria for obtaining admission at People University of Medical & Health Sciences Nawabshah are approved by the HEC for enrollment into different degree programs. Admission into various undergraduate degree programs at PUMHS and its affiliated colleges can be obtained by those students who secured first division at the intermediate level. Following courses of study are offered at PUMHS. 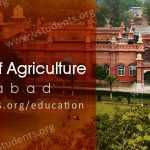 Some of the degree programs are of five years duration and some are 4-years duration. 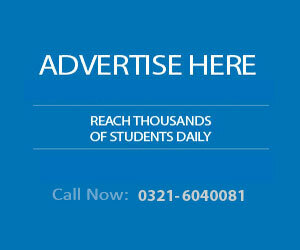 The examination is held annually or semester wise for different degree programs. PUMHS Entry test for the session 2018 is going to be held in all the affiliated Medical and Dental colleges. Those candidates who pass admission entry test will eligible to enroll at PUMHS admission merit list. Failing to qualify the entry test will cancel the candidature of the applicant. List of candidates is displayed in the admission office of the university and also uploaded on the authenticated website of the university. Candidates are advised to pay their fee dues within the last date in order to avoid the cancellation of admission. US-Aid scholarships are also given to the students for financial support. Merit-based scholarships funded by Higher Education Department are granted to the students who show good performance during the academic year and scholarships is continued by the condition that students maintain their good performance in future.